Have you been longing to get off the beaten track, get away from the crowds or the usual camping spots, and want some comfort when you get there, then maybe an off road camping trailer is for you. Make for quick get away! The benefits of using a camping trailer rather than SUV or car camping is that you can leave most of your gear in the trailer ready to go on your next adventure. Just stock up with fresh water & food, hook up your off road trailer and off you go. Also towing a small off road camping trailer wont decrease your fuel economy MPG too much, as they are generally reasonably light and dont add much wind resistance. Also you dont need a large vehicle to tow one, a small fuel efficient SUV will do the trick. 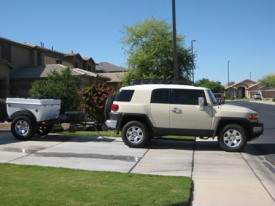 Off road camping trailers are very similar to a normal camping trailer except they are more solidly built, and have better clearance so they can be towed anywhere that a SUV can go. Make sure you buy a well known brand or check what other people have said about the trailer, as taking a camping trailer off road that is not built well or designed correctly, is likely to give you problems due to the stresses off road driving puts on the trailer. 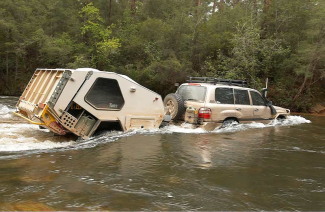 We towed a large off road camper trailer around Australia in 2005 and had very few issues with the camper itself. We should really have bumped up the rear suspension on the SUV / 4WD to cope with the extra weight, as the off road trailer was large and heavy, although at the time the camper size suited our needs for our family. Off road trailers come in varying sizes from compact two person units that will go anywhere upto large family size units that can be self sufficient providing water, and power to camp for months away from civilisation. Is the trailer dust proof? If travelling on dusty roads its amazing where fine dust can get into. How long does the trailer take to setup? It's great if you can arrive at your destination and be setup within minutes. Is the trailer water proof? If you plan to cross streams, creeks, etc. How big is the bed? When youre planning on using the camper frequently or spending longs periods away, its nice to have a good size comfy bed. Can you pack the camper away easily when its wet? We were stuck in one place for 4 days because we didn't want to pack the camper away with wet canvas on the beds. Adventure Trailers based in Arizona. Off Road Camping Trailers on eBay.